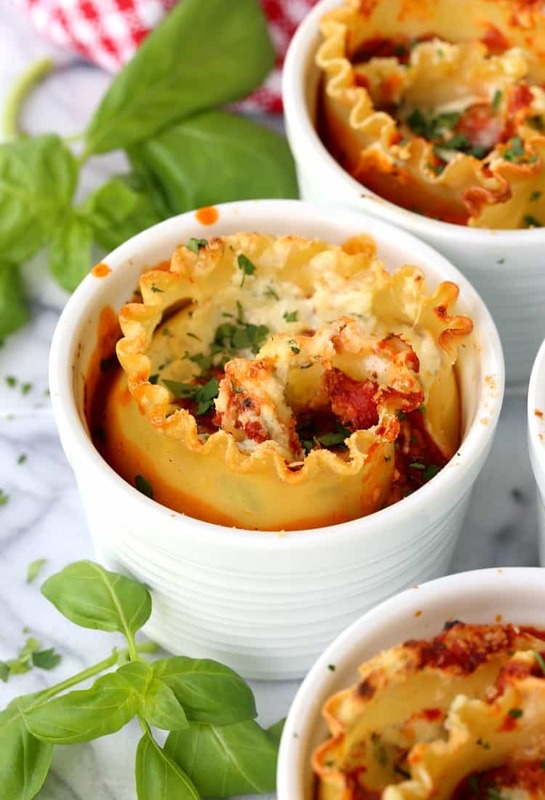 Try these Individual Lasagna Cups for a fun dinner or at your next dinner party! 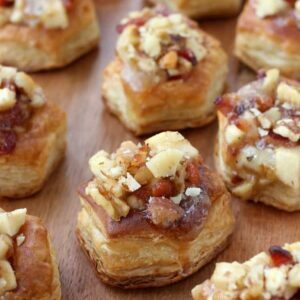 They can also be served as a side dish to the main course! Lasagna is total comfort food to me. I think for most people, unless you don’t actually like lasagna I guess. All the layers of noodles and cheese and sauce – and sausage if you’re at my house – it’s pretty hard to say no to. So when we’re doing any type of low carb dieting around the house lasagna is NOT on the menu. It’s too hard to resist. Now some people I talk to are afraid to make lasagna or just hate to do it. They never know how much sauce to cheese to noodle ratio there should be, either making a dry lasagna or a really sloppy one. And no one likes either of those options. 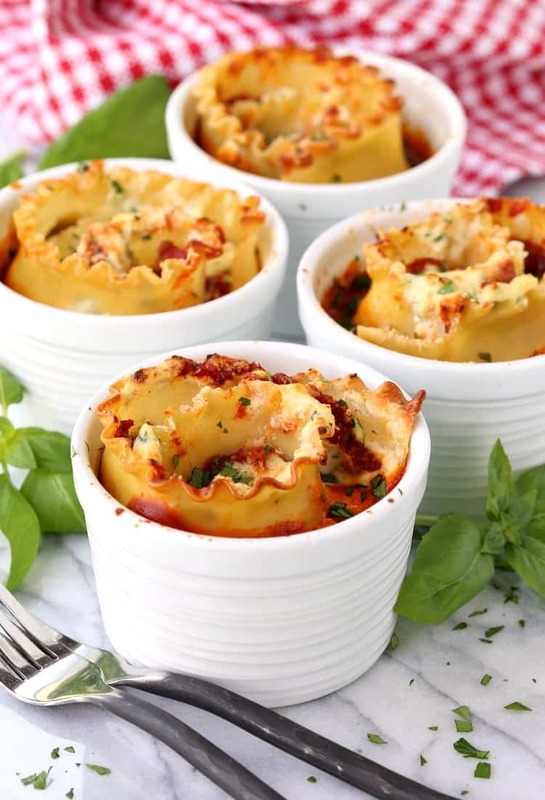 These Individual Lasagna Cups solve a lot of those problems. First of all you’re not slicing a lasagna into pieces that have to hold together and look nice on a plate. It’s all in the cup. That’s one reason I like this Philly Cheesesteak Spaghetti Casserole, it slices into perfect squares when it’s finished…very satisfying. Are you a crunchy noodle lover or a hater? There is a LOT of debate over this you guys…a whole lot. I am not a crunchy noodle fan, I would cut that off and get to the nice soft stuff underneath. Christie is a big crunchy noodle fan so she’d be eating everything off my plate that I took off. Here’s the easiest and most perfect solution. Just cover the cups with foil for the soft noodle lovers and keep the foil off for those who want the crunchy pieces. Boil the lasagna noodles the regular way, then drain them and get them onto a board. Add a layer of the ricotta cheese, then the meat sauce, then more cheese on top. 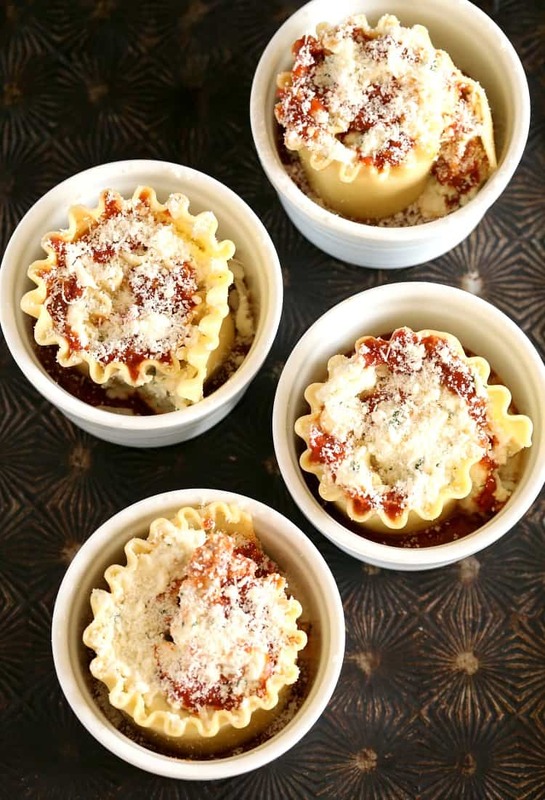 Now you can see why you’re only going to need one of these per person, especially if you’re serving these Individual Lasagna Cups as a side to a steak or something else. 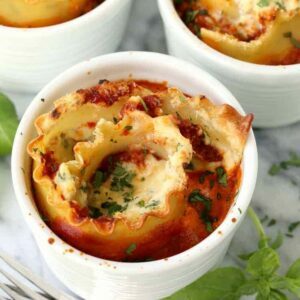 Even if these Individual Lasagna Cups are the main course all you need is a salad and a few pieces of bread to make it a meal. Trust me, all that neat sauce and cheese in there is going to be plenty. 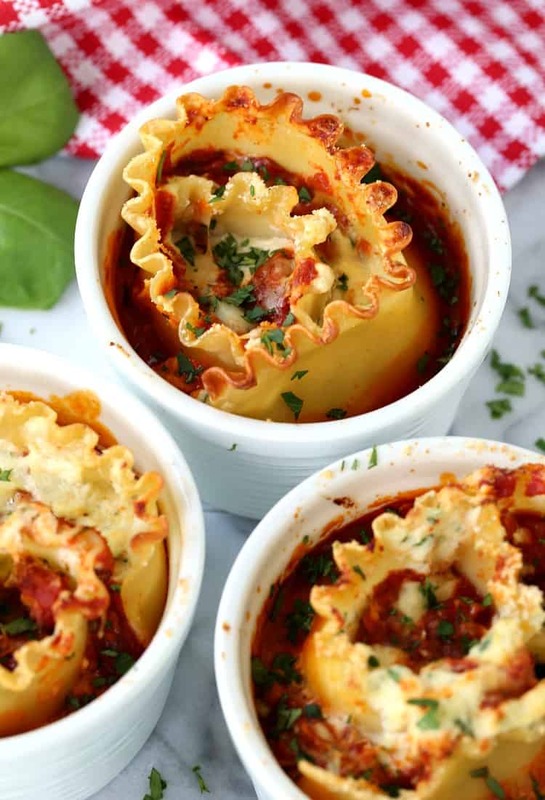 Get the lasagna cups on a sheet pan and then cover with foil or don’t cover with foil. Totally up to you. When they come out of the oven they’ll be bubbling with sauce and oozing with cheese. Just the way a good lasagna should be. As you can see we opted for the crunchy version here, mostly because I lost the argument but I do think they turned out looking better for the pictures…and Christie was happy that she got her crunchy noodle bites. Happy wife and all…you know how it goes! 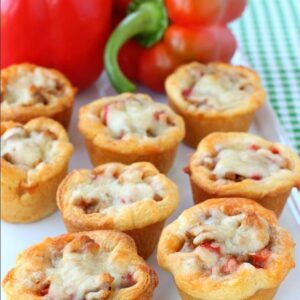 Don’t be afraid to switch up the sauce recipe or even add in more fillings like zucchini or spinach. And for you low carb followers, first of all we’re only talking one lasagna noodle here. So it’s a pretty low carb option for lasagna. But you could also slice zucchini into strips and use them in place of the pasta too! Mix the ricotta cheese, salt, pepper, egg, parsley and parmesan cheese together in a small bowl. Add the oil to a large skillet over medium heat, then add the onion. Cook the onion for 5 minutes until softened, then add the garlic. Stir and cook for one minute, being careful not to let the garlic burn. Add the beef or sausage and break up with a spoon. Cook until no pink remains then drain and return back to the skillet. Pour in the tomatoes, add the Italian seasoning, salt and pepper and stir. Cook over low heat, partially covered for 20 minutes. 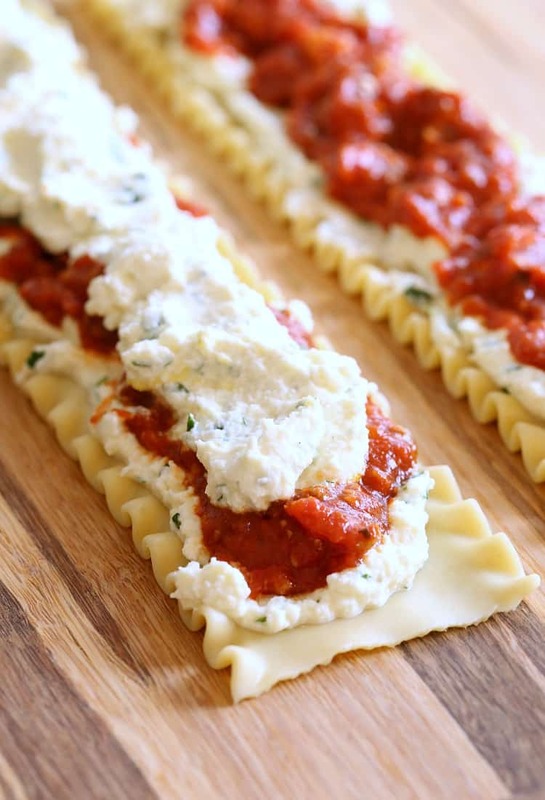 Place the noodles on a board and add about 1/4 cup of the ricotta mixture to each noodle, spreading evenly to cover. Add 1/4 cup of the meat sauce, again spreading out over the ricotta mixture to cover, then add another 1/4 cup of the ricotta mixture on top of the sauce. Place some sauce in the bottom of each ramekin, just enough to cover the bottom. Roll up the noodle carefully, some sauce and cheese will ooze out but just keep rolling. Add the roll to the ramekin on it’s side as shown. Cover with parmesan cheese and place on a sheet pan. Repeat with the other 3 ramekins. For a crunchy noodle topping, bake as is. For a soft lasagna roll cover with foil then bake for 25 minutes. 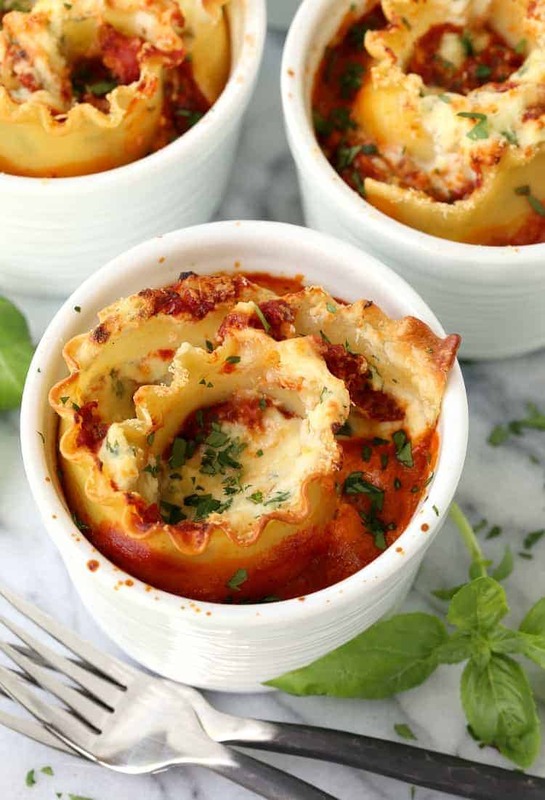 Add shredded mozzarella cheese on top of these lasagna cups too! If you do, don’t cover as the cheese will all stick to the foil. You can make these ahead of time and freeze them, or keep them in your refrigerator for a day or two. If frozen, add 8-10 minutes to the cooking time.